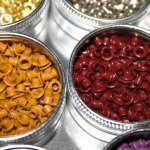 At first, as I have a lot of Making Memories embellishments, I simply kept the eyelets and such in the round plastic embellishment containers that they came in. Since I'm not big on stacking, I kept these little containers in a three-tier drawer set that I put on one of my floor-to-ceiling shelves. What's the problem with that?... Well, I ended up stacking inside the drawer anyway because I ended up with more storage containers than I could lay flat on the bottom of the drawers. 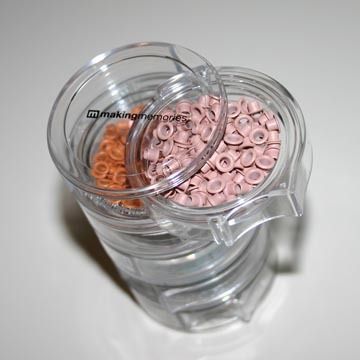 Plus, given that the round containers can't hold very much, space runs out pretty quickly. What really drove me crazy was that if you open these containers the wrong side up, you're playing "52 pick-up" with itty-bitty embellishments. So…I switched to rectangular storage tins. 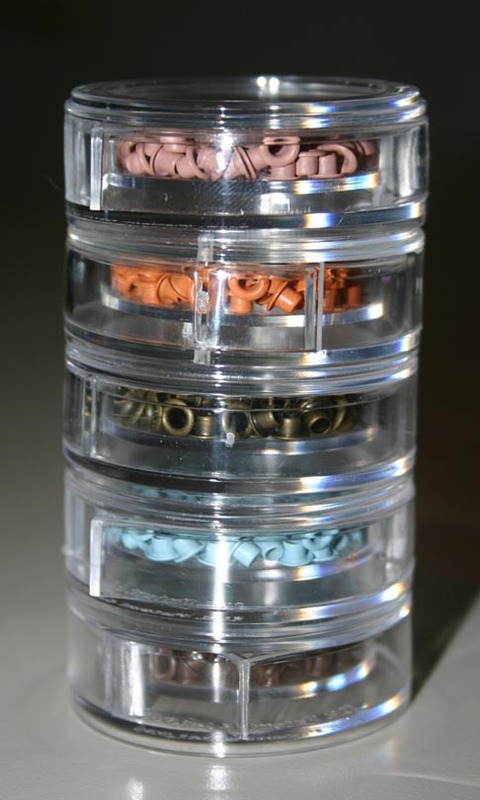 The initial benefit of the rectangular storage tin, which holds a number of round, screw-top embellishment containers (it's storage within storage), is that each container held a lot more than the clear Making Memories containers, so it allowed me to consolidate. 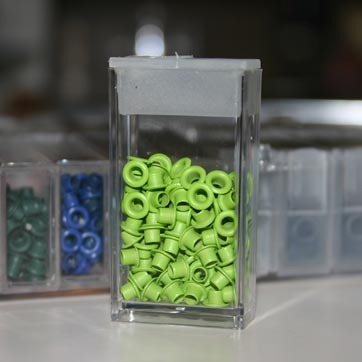 But…as they're not see-through, you don't know what color eyelets or snaps you have stored within that box, unless you have a label on top and you still have to stack. So…I decided to try a small embellishment box I bought off Oriental Trading . I've found that the best way (for me) to organize small embellishments is to be able to consolidate, but also see what you have at a glance, instead of digging through boxes/storage tins. The small embellishment box that I purchased is a modified version of a tackle box that your Grandpa might have used to store his bait. It's a clear box with 24 smaller storage boxes that more like Tic Tac boxes. The smaller boxes didn't hold as much as the screw-top containers, but the benefit of being able to see what I had "at a glance," was worth giving up a little storage space. 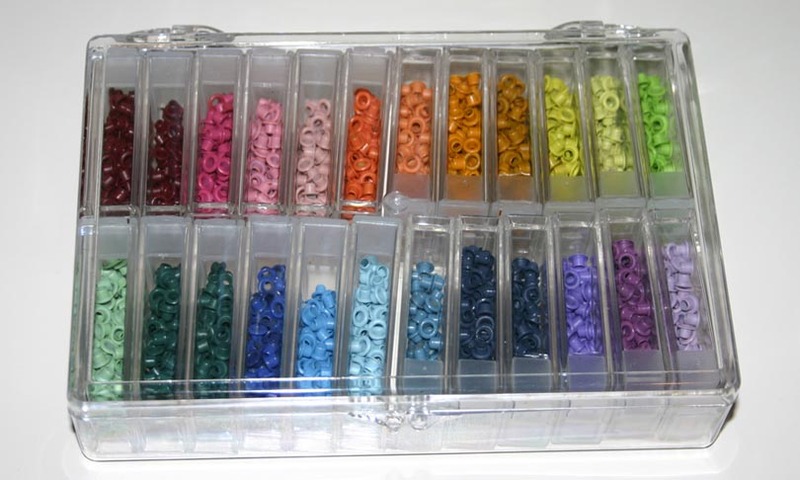 Are these the only ways to organize small embellishments? Not at all, in fact, I've found these will only work for eyelets and snaps. Brads and buttons are a whole other set of embellishments that don't fit into these types of containers because they're just too big. More to follow!